In order to get a stable supply of Antiserum Injector Charges, a Nekros desecrate build is needed, or the entire team will struggle progressing through. Generally you want to maximize range and include a Despoil for convenience. Max Range is needed to cover as much area as possible when desecrating enemies. Power Duration comes in handy if Nekros is used as CC aswell. Terrify scares enemies away in hectic situations, specially inside Jordas at Stage 3. Having it at 100% or slight above is enough. It’s good to keep Efficiency at 100% or higher. Lowering it would cost more energy (or health if Despoil is used) per desecrated corpse. Strength only matters for Soul Survivor, but the augment is used just to revive an ally in a difficult situation. *Brief Respite. This aura shines while doing trench runs at Stage 3. Shields get depleted every second on a percent base, so people who are new to Jordas Verdict tend to fail it. 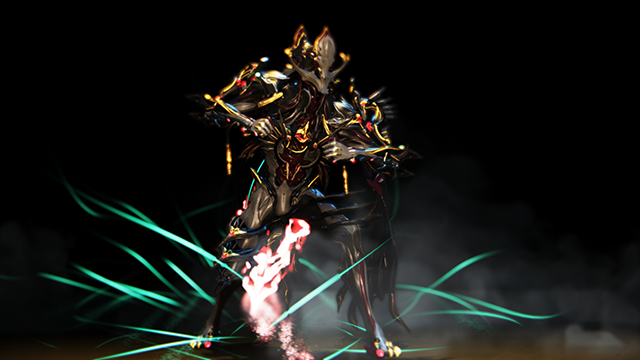 With this aura it’s enough to cast your Archwing’s fourth ability to replenish them, thus lowering the chance of getting ejected. Despoil isn’t mandatory, but comes in handy to reserve energy either for Quick Thinking or other abilities. Despite using health to desecrate, you get it back from desecrated enemies. Aura polarity could be replaced with a Dash polarity for Corrosive Projection. As soon as you’re in control of your Warframe, press 3 to enable Desecrate. Be sure to be in the same room as your team when they need desecration. Since rooms in Jordas Verdict are small, max range should cover everything. In the Decryption stage, it’s enough to stand near one of the three consoles. This way you’re inside a vaporizer bubble and cover the entire room for desecration. If the situation gets difficult with enemies, cast Terrify. That’ll scare them away.